A meme, shared by Azerbaijan President Ilham Aliyev, on his Instagram page to call attention to the death of a two-year-old girl as a result of Armenian shelling. Armenian soldiers killed two Azerbaijani civilians, including a two-year-old girl, resulting in widespread rage in Azerbaijan and defensive blame-shifting in Armenia. The inflamed public opinion in both countries is straining the ceasefire between the two sides, which already had been shakier than at any point since it was agreed in 1994. The two Azerbaijanis, Sahiba Guliyeva, 50, and her granddaughter, Zahra Guliyeva, were killed July 4 in their village of Alkhanli as a result of shelling from the de facto Nagorno Karabakh armed forces. Another relative was seriously wounded. The killings outraged Azerbaijanis, who took to social media with the hashtag #Zahra and changed their profile photos to images of the girl with her grandmother. Inevitably, Baku sought to take advantage of the sympathy engendered by the tragedy. "We have to post photos of 2-year-old Zahra... and propagate on all international platforms," said Fazil Mustafa, a member of parliament. "We need to draw attention to the murder of a child as a result of the occupation and not wait for the world to react." Many Azerbaijanis did so, including photos of the little girl's bloody body. 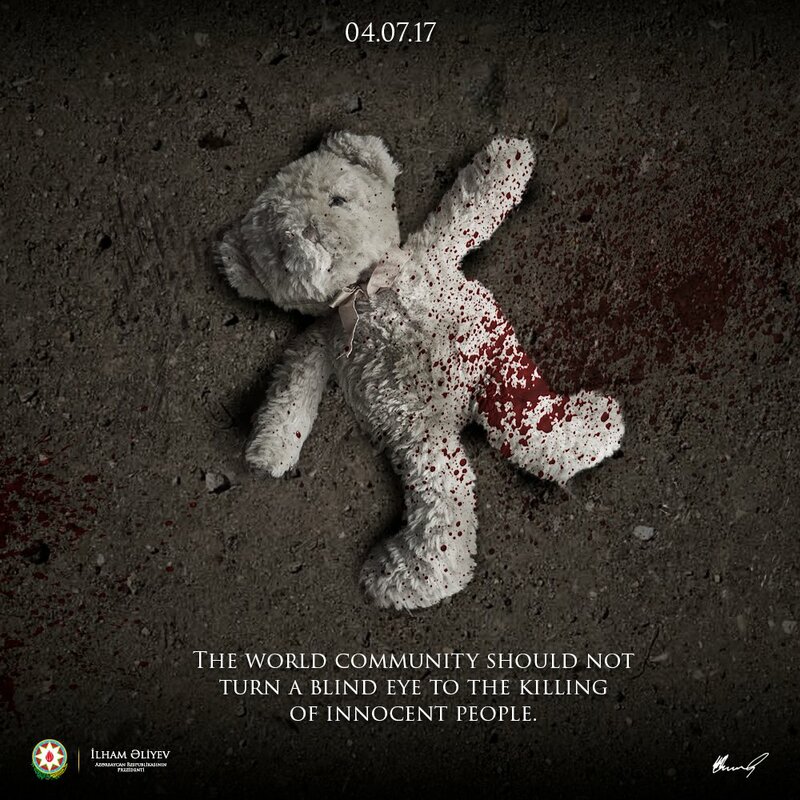 President Ilham Aliyev posted a somber meme on his twitter and instagram accounts, showing a blood-spattered teddy bear on the ground and the caption, "The world community should not turn a blind eye to the killing of innocent people." Aliyev's wife and vice president, Mehriban Aliyeva, wore a headscarf in mourning. Their daughter, Leyla Aliyeva, quickly composed a poem in memory of Zahra, that included the lines: "Who brought to us such grief/And tears of uncounted pages?/They shot with dark force/And horrible smiles on their lips." The authorities in Stepanakert, meanwhile, acknowledged that they had killed civilians but laid the blame on Baku, which they said had started the skirmish by firing Turkish-made TR-107 rocket launchers and other artillery across the line of contact. Few expressions of regret from the Armenian side, it seemed, came without a "but" qualifying them. "There are no enemy children, especially not two-year-olds. But there are cases when, because of brainless cowards, children are killed," wrote Senor Asratyan, the spokesman for Karabakh's ministry of defense, on Facebook. "This is what happened the evening of July 4, when Azerbaijani fighters hid among civilians and fired from rocket launchers, and the target became a two-year-old girl. Unlike our neighbors, not far removed from the Neolithic Era, we are forced to state this fact with pain and express condolences." Since last year's so-called "April War," when at least 200 people were killed in the most serious fighting since 1994, many in the region have been dreading what seems like an inevitable resumption of fighting over Karabakh. "We're not trying to resolve the conflict," a European diplomat told EurasiaNet.org last month in Yerevan. "We're trying to prevent a war." In this highly charged atmosphere, genuine expressions of peace were nearly drowned out. "Azerbaijani people try to displace their anger against their father, mother, the government, the state, on to the Armenians," wrote the Azerbaijani artist Aras Bulba in a Facebook post. "Sharing the bloody picture of the baby, they try to cover up their cowardice, their long service to evil and it comforts them....It's not the Armenian people who killed the baby, but the system that many of us support. We also support these deaths with our own hate." Armenian journalist Grigor Atenasian tweeted: "I'm Armenian and unapologetically pro-Armenian and I offer my sincere condolences to the family of the killed Azeri girl. Shame. RT if agree." As of when this post was published, he'd gotten three retweets.